This was not quite the contest which brought the Champions Trophy alive, alas, but England will not lose sleep over that. They became the first team to qualify for the semi-finals with a comfortable 87-win against New Zealand. A grimy Cardiff day during which persistent showers gradually gave way to howling winds demanded application and resolution and they were not found wanting. New Zealand were in the game as long as their captain Kane Williamson was at the crease, gathering runs with his usual precision. At 158 for 2, they were more than halfway to their target of 311 with two wickets lost and nearly 20 overs remaining. 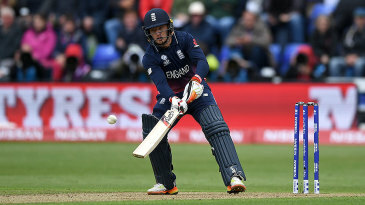 But from the moment Williamson fell for 87 from 98 balls, unhinged by a ball from Mark Wood which reared at him from just short of a length, they looked ill equipped to compete, losing their last eight wickets for 67 in 14 overs.